Looking for some positive reinforcement, aka bribery, to get your nearest and dearest to do what you ask them to do (so nicely)? Then check out the new collection of merit badges from The Honor Society. 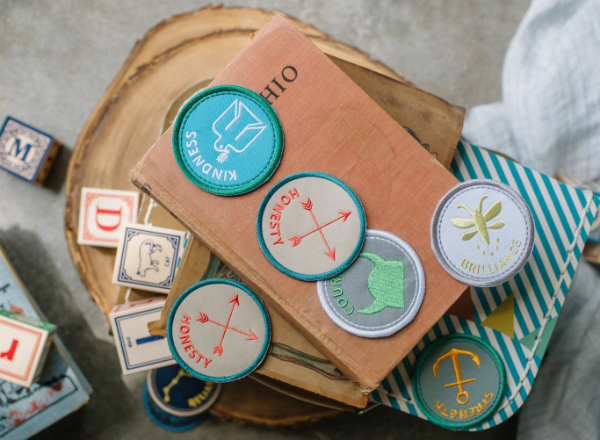 A modern take on a vintage idea – think of them as updated version of Cub Scout badges, but way cooler. Intended to encourage and reward good deeds, the series of badges come in seven variants: Bravery, Brilliance, Courage, Honesty, Kindness, Resourceful and Strength. The Honor Society hopes they will encourage little people to, ‘do good, be good, and live good’. Sew them onto clothing, a school bag or stick them up on a wall. Incentivising behaviour does work. Reward charts are a great way of reinforcing a really good job and helps to keep kids motivated. Remember, the difference between a bribe and a reward is that a bribe is given before the behaviour you want. A reward is given after and helps to reinforce good behaviour. Badges go for $7 a pop and are available exclusively at Perfectly Smitten. Good luck!